Available from Imatech , the Hougen HMD151 low profile magnetic drill is portable and designed for general fabrication. 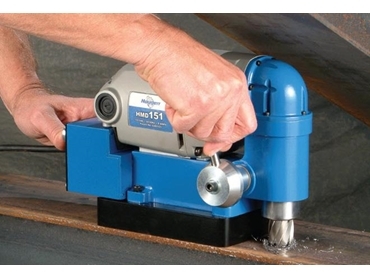 The HMD151 magnetic drill provides fast and efficient hole-making in one lightweight package. It is portable and small enough to drill in places where hand held electric drills are not, yet it retains the power to cut holes up to 35mm in diameter to 25mm deep faster than conventional drills. The magnetic drill features a rigid quill feed to prevent tool vibration, eliminate gibs, slide/way adjustments and maintenance while providing a constant low profile. The removable feed handle exposes a hex-head for ratcheting the feed in close quarters and the drill also feature a positive slug ejection. The drill’s controls are rear mounted to optimise ergonomic use.